The modern Air Jordan has officially made its comeback with the Jordan XX9. At some point during the past decade, the Air Jordan stopped being "cool." That's not entirely true, of course, since the retro market for Jordan models 1 through 14 has exploded in recent years; but the extreme popularity of MJ's older footwear is somewhat insulting to more current offerings. Some of the modern Jordans were lauded for their performance on court, but kids were not scrambling to get their hands on, say, a pair of Jordan 2012s. That's beginning to change. It began with last season's Jordan XX8, which wooed consumers with Flight Plate technology and enticed them with a radical designâwhich was then scaled down to a more traditional silhouette with the Air Jordan XX8 SE, further pleasing the masses. But even as Flight Plate was almost universally praised as one of the best performance technologies available, the XX8 could feel stiff, both on the court and off. At times your foot slipped when you attempted to make a sharp cut on the basketball court, and the shoe wasn't as durable as many had hoped. That's beginning to change. It began with last season's Jordan XX8, which wooed consumers with Flight Plate technology and enticed them with a radical design—which was then scaled down to a more traditional silhouette with the Air Jordan XX8 SE, further pleasing the masses. But even as Flight Plate was almost universally praised as one of the best performance technologies available, the XX8 could feel stiff, both on the court and off. At times your foot slipped when you attempted to make a sharp cut on the basketball court, and the shoe wasn't as durable as many had hoped. 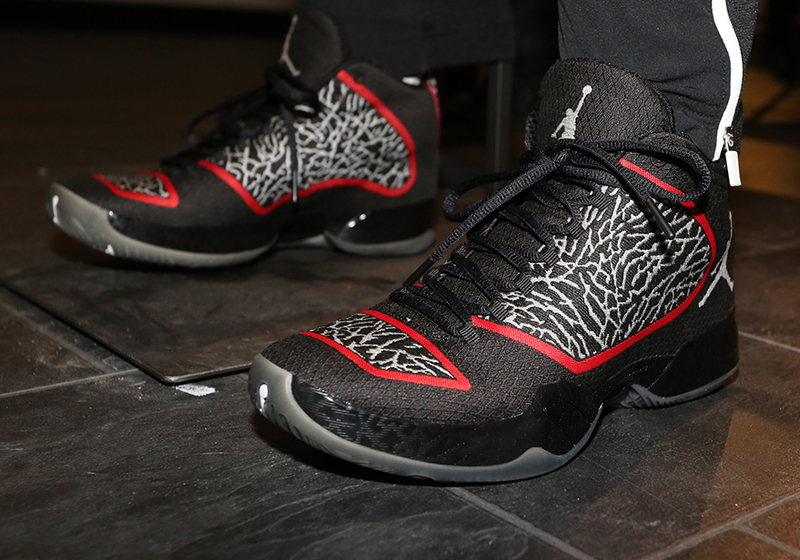 Wearing the Jordan XX9, which will hit retail stores Sept. 6, is like playing basketball in a slipper. During a media wear test at Jordan's former home in the Chicago suburb of Highland Park, I had the opportunity to hoop in the XX9. After the games, many of my fellow media members said at times they forgot they were even wearing a shoe, a sentiment with which I strongly agreed. Once you laced up the XX9s to your ideal tightness, there was nothing left to fidget with, allowing you to bound up and down the court with a clear mind. And though you can't feel the Flight Plate to the same degree as you could in the XX8—when you sometimes felt like you were walking on a padded spring—that wasn't a negative to me. It gives the shoe a more realistic feel, and it let's you feel the court beneath your feet as you move. There were truly no negatives to playing in the XX9. The author (right), playing horrible defense while wearing the Air Jordan XX9. The shoe is also aesthetically pleasing. The XX9 will release in two different versions, one louder than the other. The elephant print patches on this version might turn some sneakerheads off, but the version I wore, pictured at the top of this article, is incredibly clean. Some might hem and haw about the oversized graphics, from the Jumpman on the heel to the enlarged "23" on the tongue, but I love it. It's different, just like the shoe's construction. Plus, it was Russell Westbrook's suggestion to blow up the Jumpman, and what's cool for him should be cool for us. The translucent sole and subtle elephant print add to the shoe's appeal. The XX9's price tag ($225) is unfortunate, since it will preclude many players from acquiring the shoe. Using premium materials from Italy might be an expensive proposition, but there's still no reason to charge over $200 for a basketball shoe. Nevertheless, if you have the money and want to play in extreme comfort while keeping your foot locked down, the XX9 is as good as you can get. The modern Air Jordan has officially made its comeback.